Golden and Odin practice basic commands outside as part of their daily routine. Odin is one of five dogs recently adopted from shelters and animal rescue centers to become detector dogs for wildlife disease surveillance. The dogs are housed and trained at the USDA-APHIS National Wildlife Research Center (NWRC) in Fort Collins, Colorado. 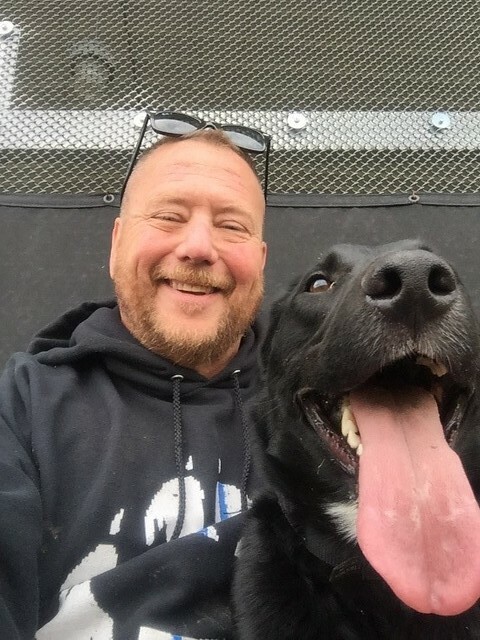 They are part of a collaborative 12-month program to evaluate the effectiveness of training and using dogs to detect and identify waterfowl feces or carcasses infected with avian influenza (AI). If successful, this collaboration may be extended an additional 12 months. Moose (a black and tan coonhound) tries to identify the odor box that contains the target material. 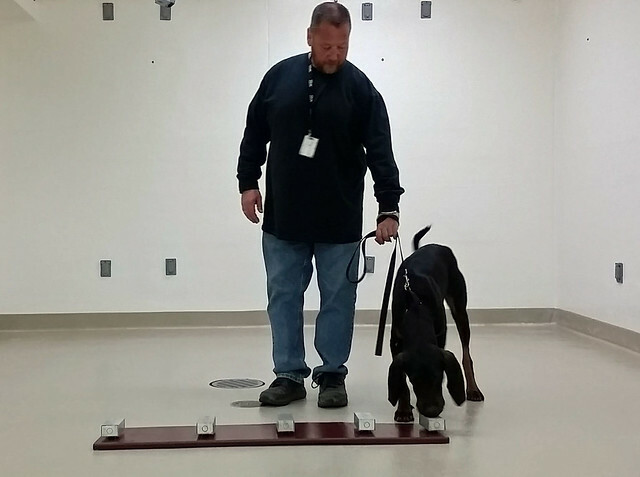 Moose is one of five dogs being trained at the USDA National Wildlife Research Center to detect avian influenza-infected materials for disease surveillance. Previous NWRC and university research shows that some diseases cause odor changes in infected animals. Because their sense of smell is so acute, dogs can detect those changes. Avian influenza, and in particular the highly pathogenic version of avian influenza, is a disease that can be carried by wild birds like ducks without them appearing sick. However, the disease is very deadly to domestic poultry, like chickens and turkeys. APHIS already conducts surveillance testing of hunter-harvested ducks to determine if HPAI is present in the wild bird population as an early warning for the country’s poultry industry. The detector dogs would provide APHIS with another tool to broaden surveillance. The spread of highly pathogenic AI in commercial poultry and backyard flocks in the spring of 2015 resulted in more than $800 million in damage and control costs, as well as the lethal removal of nearly 50 million domestic birds. Dogs are not susceptible to avian influenza, but Odin and his colleagues are vaccinated for rabies and other canine diseases they may be inadvertently exposed to while conducting surveillance in the field. Once finished with their training, the dogs will be paired with an APHIS Wildlife Services field specialist for disease surveillance activities or, if found unsuited for surveillance work, placed in an adoptive home. NWRC is the research arm of APHIS’ Wildlife Services program. Its mission is to use scientific expertise to help reduce human-wildlife conflicts related to agriculture, natural resources, property, and human and health and safety. For more information, please visit our National Wildlife Research Center website. 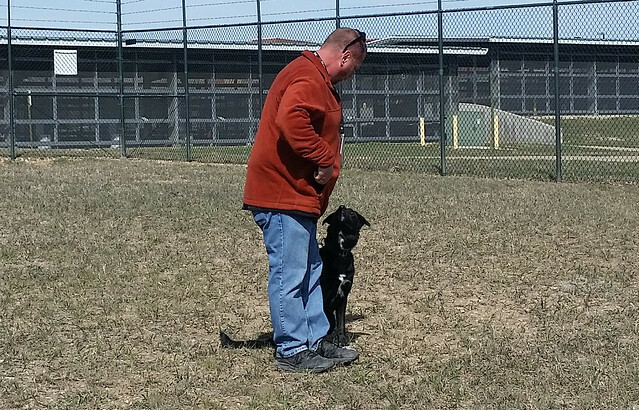 Colorado State University researcher Dr. Glen Golden and Odin taking a break from detector dog training. A whole new way to look at domestic dogs as man's best friend! What a great project and keep up the great work. This report is inspiring. When most people think of dogs + surveillance, they rarely think past law enforcement or military security. It's wonderful to read about the things dogs are already doing in collaboration with their human handlers, as well as the possibilities. I applaud Dr. Glen Golden for pursuing this work, especially after the "Bird Flu" scares of the past. Training dogs is hard work! (Our dog can fetch, she just prefers not to. Sigh.) Thank you again for your dedication.